Did you know that the Ladybug was really named for Our Lady? It’s true! During the Middle Ages, farmers prayed to The Blessed Virgin because pests were destroying their crops. The ladybugs came and ate the pest and therefore were named Our Lady’s bug, which was shortened to Ladybug. 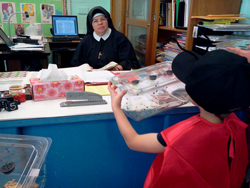 On April 25, 2012, the garden club ordered 1500 ladybugs for students to observe. A very special little bug delivered containers filled with the insects to each class. 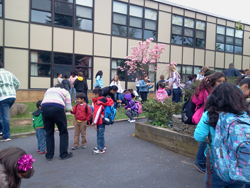 Then, right before dismissal, all grades met on the playground to free their bugs. Students, teachers and parents joined in the release. 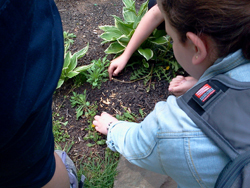 What fun it was to see everyone enjoying nature up close.